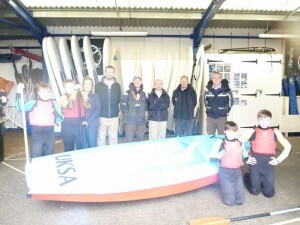 An abandoned boat has been upcycled by a group of Cowes Enterprise College students who spent several mornings at UKSA learning valuable boat maintenance skills. The boat was donated to UKSA by Yarmouth Harbour Commission’s berthing master Dante Russell, who said there were limited facilities for disposing of unwanted boats, but recycling them to a charity put them to good use and was better for the environment. At UKSA the boat became a long-term project for four students on the Youth Engagement for Schools (YES) programme, which aims to prevent students from dropping out of statutory education by providing active learning opportunities in small groups, outside their normal learning environment. Ryan Crozier, 14, Chad Cooper, 14, Joe Hall, 13, and Dylan Colvin, 13, attended UKSA once a week to work with boatbuilder Gareth Ely to learn hard skills such as using tools, restoring paintwork and getting the boat safely afloat again. However they benefited from a range of soft skills too, such as communication, decision-making, participation and team work, self-belief and determination.